Thanksgiving as come and passed and I’m still processing. For us, it was a very peaceful Thanksgiving. Having just welcomed a newborn, we decided to avoid traveling and other wonderful people’s germs. We enjoyed a delicious Thanksgiving turkey dinner and had a fairly easy day. The kids will tell you all about the pumpkin pie, but for Susan and I, we got to catch our breathe a little bit. We’re obviously grateful for the addition of Baby Bri and we’ve shifted the family story from “We were trying to keep it at 3 …” to “We’ve always asked God for 4 – 2 boys, 2 girls, hashtag answered prayers.” But if i can let you in on a little secret, I’m extremely grateful in the big life picture, but I haven’t always been grateful in the day-to-day operation of life. It’s not just about welcoming a new-born, three awesome but energetic kids, an amazing wife who unfortunately, only has two hands, a fast-moving ministry calendar, National Grid sending me notices that the price of electricity has gone up by 20%, and a fantasy football season that has not gone as planned. I am in lament for Ferguson. Among the many emotions, lament is the word and feeling that keeps coming up for me. I felt it soon after August 9th and posted a long list of laments then, many of which I still feel today, some even stronger. Specifically today, I lament that many are going to miss an opportunity to understand the larger hurt this represents. I lament the pain this represents to countless people, people I know, many that I don’t. I lament that we often judge a situation by its worst representatives. I lament that we often judge a situation from a narrative that will only allow us to to see this from a singular, pre-determined view. I lament that we will likely never know exactly what happened between Officer Wilson and Michael Brown. 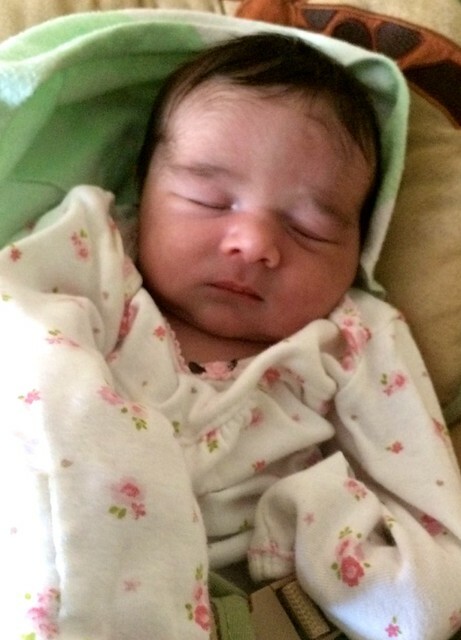 This past week we welcomed the addition of our baby daughter to our family. Born on the morning of November 5, Brianna Joy came out healthy, and happy to no longer be confined to the tiny quarters of her mother’s womb (She told us this, “Yeah like anyone would want to spend their existence restricted and spoken to through skin and membrane walls. But really, I’m grateful to be here with you all. I want to be held, known and I want to love my family. Ok, I‘d like some milk please.”) I know, I thought the same thing you’re thinking – She has her mother’s sarcasm and her father’s sweet, gentle spirit. It’s been a long pregnancy for Susan, and I imagine for Baby Bri. And for the sake of camaraderie, I’ll throw myself in the mix because, really, is there a such thing as a short pregnancy? If you’re listening and sympathizing, it doesn’t go very fast. But it’s great to finally meet her because she’s felt hidden for so long. I have asked our other children if they remember being in the womb, and they all reply “Yes.” And they walk away to play with they Legos when I ask them to describe it. Fortunately, I remember my experience waiting to be born. It was warm, softly lit, fairly comfortable if you didn’t move too much. Unfortunately the wifi was sporadic and my Treo always needed to be rebooted – that part of the experience was disappointing frankly. I also remember trying to time my arrival to be memorable but I didn’t want to compete with Jesus so I decided to be born on Christmas Eve. Looking back on it, I feel I over-thought that as I now realize that though you can miss the beauty and meaning of Christmas, nothing can really compete with Jesus. But I was young and didn’t know any better. I also remember things like the doctor who pulled me out ((his name was “Doctor”). He wore these blue latex gloves, had bad breath and hadn’t shaved that morning. I remember the nameless nurses and how they were so excited to meet me and make me presentable and how they handed me off to my Mom and Dad. I remember telling my parents, “So you named me Timothy -that will work. So you immigrated from Egypt to the United States and you picked Jersey City to begin our family? We couldn’t have found a place in Miami?” That last part doesn’t really sound like me back then but that’s my parents’ account and over time the line between stories and memories run together so I just go with it. Fast forward to today, I’m still thinking about Brianna’s time in her mothers’ womb. Like all parents holding a newborn, we keep saying, “Can you believe she was just inside there?” Pretty incredible how these human people are born. Further, and maybe regular readers and friends are tired of hearing this but I just can’e believe we have this big family since we struggled so much with infertility – ridiculously thankful in the big picture. Now to be truthful, there are days when I act less than grateful for what I’ve been entrusted with but when I take a step back, I’m really humbled by the fact that we’re parents of a growing family. I for one think Brianna is going to have it pretty good. The youngest of four but since all her siblings are close in age, Susan and I are still in super-parent mode. While we haven’t slept much in 6 years, there is a minimal gaps in our infancy knowledge. How often do you feed a baby? Change a baby? Burp a baby? Hold a baby? Forget about what the books tell you – the answer is always. Four Kids – still trying to wrap my head around it. Can we really do this? Sure we can. But how well will we do it? Can we provide enough care, affection, can we afford it all, what will their opportunities be like? You think of the other questions, Which kid will get or feel neglected? Who is going to have the hardest time? Which one is going to hate us? Gathering from my own adolescence and from my years of serving in student ministry, I remember that whether you have one, two, five or many more that it doesn’t matter, each kid is going to hate you at some point, each kid is going to feel short-changed at some point and everyone goes through their own valleys. Our prayer will be that each one also find love and identity on the other side of this. Similarly, being a ministry family, I of course, wonder what the quality of their faith will be, if they will resent the faith/church or if in the big picture, this will be among the privileges they will later claim to have? And of course, they will each have different experiences, perspectives, callings, futures, pasts, right nows. How can we really manage all this? Here’s what I learned on Bri’s birthday. It’s amazing how holding a newborn brings peace to the questions. They probably won’t go away but I am reminded once again of the power of presence. Further, I am reminded that there are no foreseen limits to a parents’ love. Though human and finite, the word unforeseen feels right because when we truly love, we don’t see the limits. It’s as close as we have to knowing something eternal, something transcendent; it’s very spiritual and probably where we find it most accessible to relate to and connect with God. It’s extraordinary, a bit illogical, and among the differences between romantic love and the love you have for your children is that it feels magnified when you love your children alongside your spouse. And so to cut to the chase, we don’t manage children. Or at least we shouldn’t. There is no sure-fire way to safe-guarding a child’s future. We can try as much as we like but there are no guarantees in this life. We can be intentionally faithful, we ought to be diligent, we must be prayerful, we can introduce, guide and help our children process all sorts of things ranging from soccer to ballet dancing to painting to serving to New York sports teams to the sacred to the trivial to the many things in between. But we can’t guarantee, we can’t control, we dare not manipulate – instead, we walk together. Somewhat self-aware, I know I’m on riding the high of welcoming a new-born. I doubt my 29 year old self would be able to relate to this post, and in some ways, it would feel like pushing the dagger a bit further. Similarly, I’m cognizant that my 49 year old self might be embarrassed by all this. All I can say is that it’s the testimony of the moment, and I feel I gained something here and chances are there was much to be gained at 29, and more so at 49. Married, single, divorced, widowed, waiting, changing diapers or enjoying being a grandparent, love feels accessible to all of us, and most likely, different than what we anticipated. It’s late and I probably shouldn’t post this tomorrow but I’m sure you’ll forgive me if I sound a bit over-dramatic about our daughter’s birth. And if not, then please dismiss this as the passionate expression of a proud father. Frankly, it’s a great fraternity to be a part of.